Both breath-taking and overwhelming at the same time, the 1.6-kilometre deep and 16-kilometre wide Grand Canyon is a testament to 2,000 million years of geological history. Nearly as alluring as the canyon is the powerful Colorado River snaking its way through Grand Canyon National Park, beckoning visitors to take short guided boat trips or a multi-day adventure. Sign up for a ranger-led program to learn about geologic history, majestic birds of prey, animals living in the extreme environment and the area’s early inhabitants. Continuing a tradition that began with the ancestral Puebloan people, several tribes still call the Grand Canyon home. Powerful and inspiring, Grand Canyon National Park in northern Arizona is no doubt on every traveller’s must-see list. This UNESCO World Heritage Site is arguably one of the USA’s most famous landmarks and encompasses nearly 5,000 square kilometres of plummeting canyons, multi-coloured rocks, dramatic cliffs and stunning ravines. There are plenty of overlooks from which you can admire the view, including Mather Point and the Toroweap Overlook. Even though the favourite activity at Grand Canyon is to stand on the edge and overlook the beautiful landscape, there are many other ways to enjoy the park’s natural splendour. Take a mule ride along the South Rim trail or take a white-water rafting trip down the Colorado River. 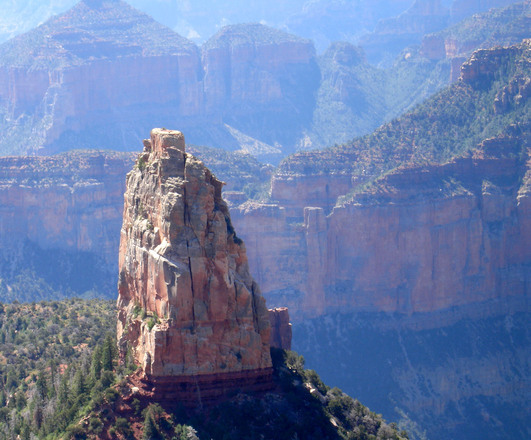 Alternatively, you can admire the canyon from above on a helicopter tour.